The Hyundai i20 Active has been launched in India. The jacked-up, soft-roader from the Korean automaker was previously teased in a sketch and was even captured by spy photographers earlier in the year. Unfortunately, those hoping for a lifted supermini that’s able to traverse the odd water crossing or so will be disappointed to know that the Hyundai i20 Active is not exactly the toughest thing on four wheels. Despite the butch exterior courtesy of a 20 mm increased ride height and additional (plastic) body cladding, the compact crossover will only be offered with a front-wheel drive layout. Engine options will mirror those found on the regular Hyundai i20 (dubbed the Elite i20 in India), as well. The 1.4 litre, diesel engine with 89 hp and 220 Nm of torque is mated to a six-speed manual transmission while a 1.2 litre, petrol mill with 82 hp and 114 Nm of torque gets paired to a five-speed manual gearbox. An automatic transmission option is not available. 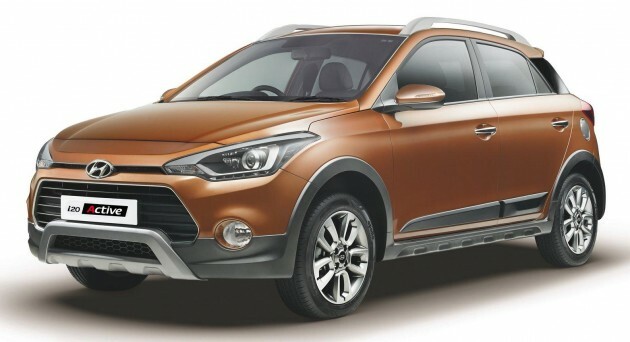 As for its dimensions, the Hyundai i20 Active measures in at 3,995 mm lengthwise, is 1,760 mm wide and stands at 1,555 mm tall with the roof rails accounted for. Wheelbase is tagged at 2,570 mm – the same as the regular i20 supermini. Luggage space is also identical to the i20 with a 285-litre figure quoted. Aside from the aforementioned add-ons, the Hyundai i20 Active also features restyled 16-inch alloy wheels and projector head lamps with LED daytime running lights. Inside, standard equipment includes automatic air-con, an eight-speaker audio system with USB/AUX connectivity and a 1 GB internal memory. Two colour schemes are available for the interior – Tangerine Orange and Aqua Blue. Just buy a car for trade-in purpose? Kimchi may be good in quality, but no RV. I am enough of sour faces during trade in discussion. That blue dash… never seen anyone did it since old Proton Saga. Hav u heard of chevrolet cruze? BTW, im not drivin it! Blue dash board??!! I want……NOT!. Looks like and extended station wagon. Are they going to be sold here. Which are their competitors. Iriz, Myvi Jazz, Fiesta, Mazda 2 or any others.